Extend your system with the Sepasoft™ Recipe/Changeover Module to expertly build, manage, and monitor recipes. This powerful module is ideal for quickly and accurately changing machine, process, or system recipes. This module greatly reduces the time usually required to manage production recipes and is a must-have in any industry that produces different products or runs machines in different modes. A recipe defines settings and amounts to manufacture a specific product in a consistent manner. It is an essential part of the production process. Recipe software fits into the MES layer that resides between the ERP layer and the plant floor. Our Recipe/Changeover Module provides an efficient means to manage and select recipes, track variances in recipe values, keep recipes secure, track recipe changes, analyze recipes, and generate recipe reports. Reduce the effort required to manage numerous recipes with master recipe functionality, which is only available with our Recipe/Changeover Module. When you change a setting in the master recipe, it will replicate down to all of its sub-recipes while still maintaining the specific values of each sub-recipe. With unlimited levels available for master recipes, you can organize recipes in a hierarchical manner, greatly reducing the effort to maintain recipes. If you need additional functionality beyond the out-of-box functionality of the Recipe/Changeover Module, you can use the script functions to accommodate your production environment, instead of changing your production environment because of software limitations. Set permission for which roles can change which recipe values and by how much. For example, you can give the Administrator role permission to change a setting from 0–100, while limiting the Operator role’s permission to change the setting from 20–80. The changelog is valuable in normal production environments and is especially critical in industries with significant compliance requirements. After a recipe is selected and once the initial recipe values are set, it is vital to monitor them for any variances to prevent quality issues, downtime or other production issues. 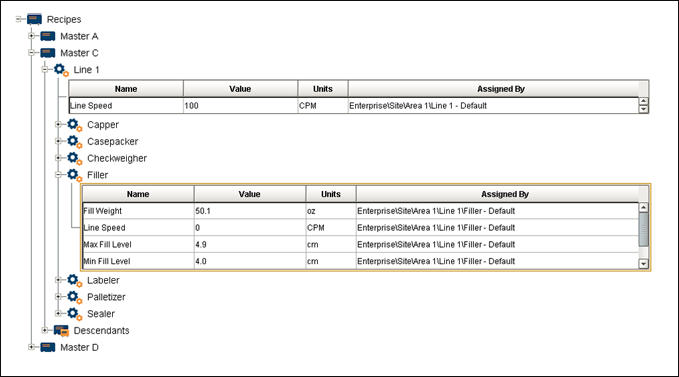 During production, recipe values can be changed from systems outside of the recipe management system, such as an operator interface terminal local to a machine. 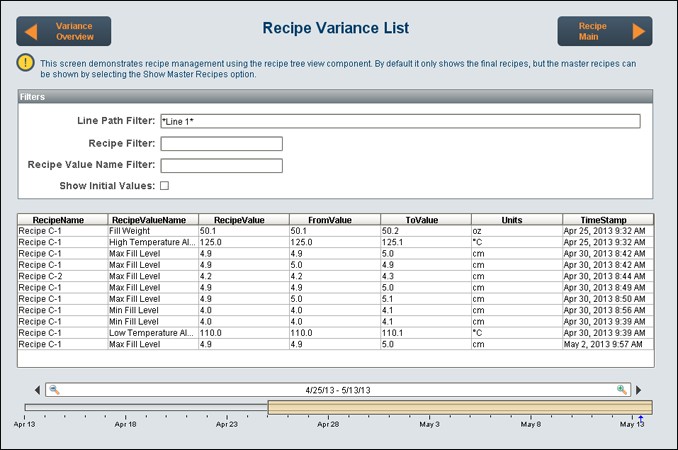 By monitoring the recipe values, the variance log in the Sepasoft™ Recipe/Changeover Module lets you detect variances in real time or review variances by production run or date range. These capabilities make it possible to identify the root causes of production issues early on. Unlimited active recipes per physical production site and Ignition server license. One active recipe per machine license. When you add the Ignition Reporting Module, you can also create multi-page reports with the recipe analysis information, and more.